First off, a little from our day here. The leaves are changing and it looks to be a beautiful fall. Here is a little video of the ewe flock moving up the road to their next grazing field. Not very exciting but pretty none the less. Can you hear the leaves? If I were close to Idaho, I would go to The Trailing of the Sheep Festival. Check it out here. For me, I'll just have to watch ours. Now onto my subject of the day. 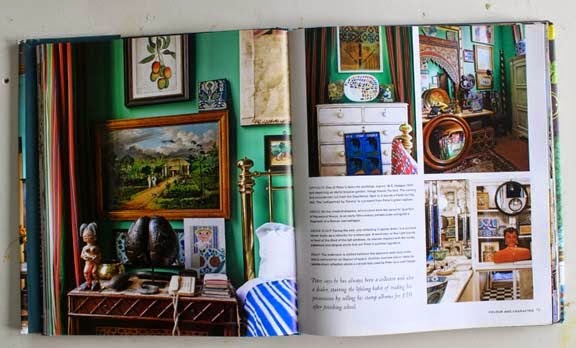 Yesterday I wrote about paint entrepreneur and artist Annie Sloan. 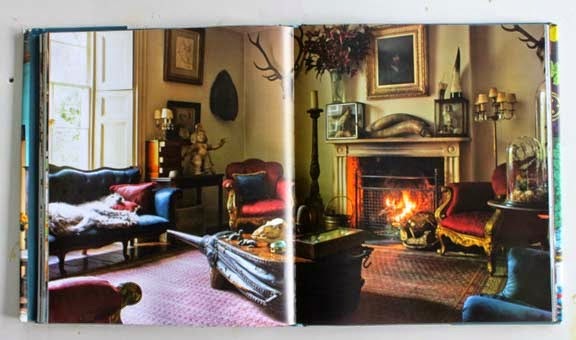 Today I want to introduce you all to Ros Byam Shaw and her series of books on English interiors published by Ryland, Peters and Small. Ros is also a past Features Editor at my favorite mag World of Interiors. You can read an interview with her here on the the Ryland, Peters and Small website. 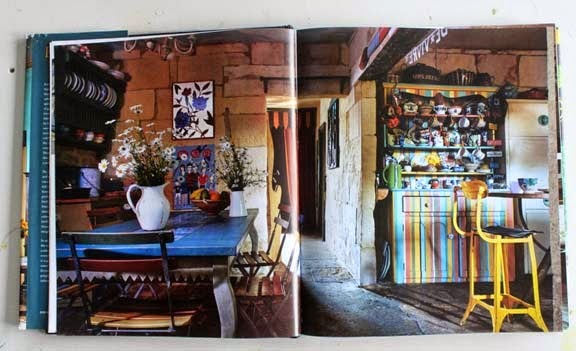 When I was researching and looking for inspiration when writing the upcoming Crafting a Colorful Home (Roost January 2015), I discovered two of Ros's books - Perfect English Cottage and Perfect English Farmhouse. Both were photographed by Jan Baldwin. 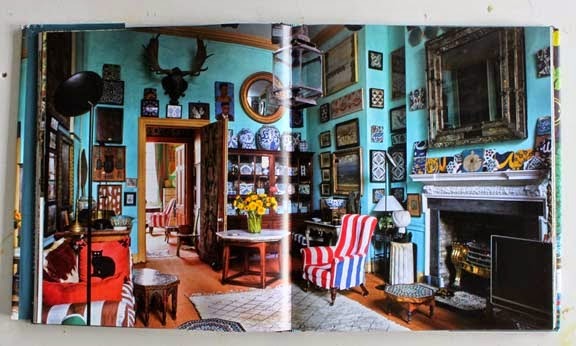 I purchased them and spent time reading the different profiles of the owners of the homes and how they decorated their spaces. 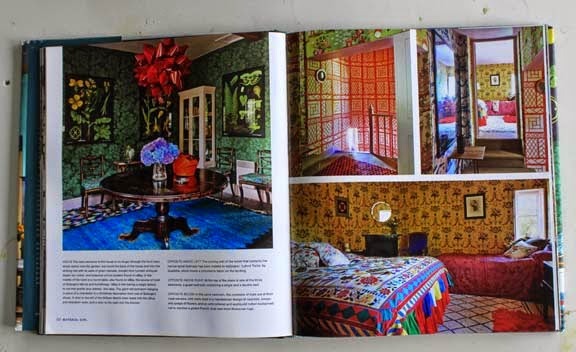 Each book featured about 20 different homes with stunning photography. I love a good house book and these helped me keep interested in writing about my home where my family and I have lived for 16 years. Just this spring, Ros had another book published called English Eccentric. It is even better (IMHO) than the two mentioned above. 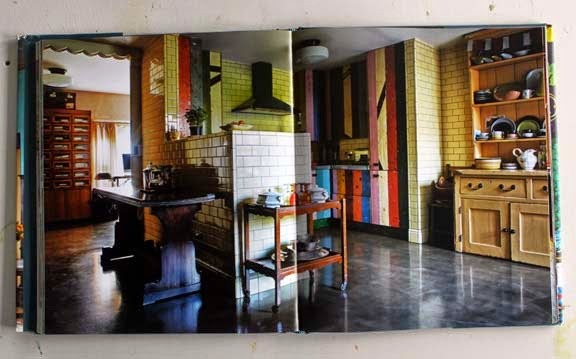 It is colorful and full of stories of families building their own style homes throughout the UK. I keep going back to it again and again to look at all the little details on the pages. I savored every page by reading a chapter at a time vs. going through the entire thing at once. Gorgeous. 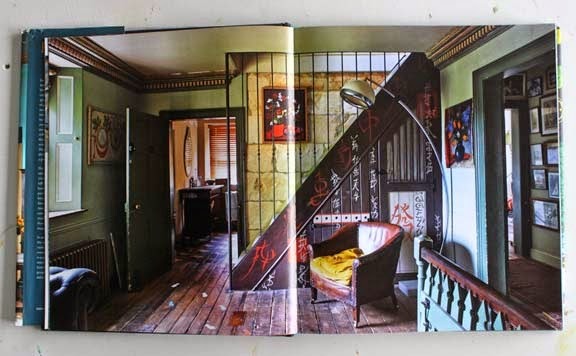 Below is the home of Antoni Burakowski - half of the fashion label Antoni & Alison. Love the colors in the kitchen. That striped cupboard is to die for. I know that most of these photographed homes might not be for most of you but there are bits that you can take away for inspiration. 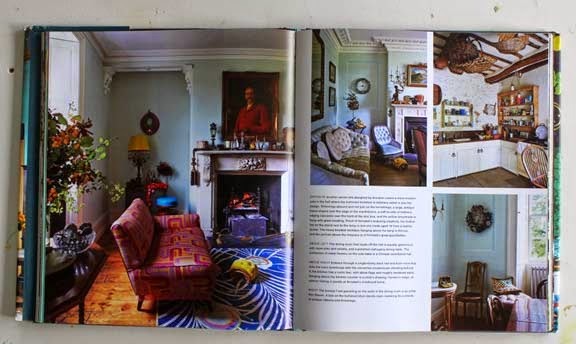 This is the home of Fanny Ward - stylist and collector. This is the home of Adam and Charlotte Calkin. Adam is a decorative painter and you can see more of his work here. Fabulous. Every inch of this home says "creativity." What makes these homes special is the owners go out on a limb and decorate as they want to. Trust me - none of these homes are what realtors would suggest for resale. Most realtors want white, beige, and lack of character. YUCK. None of these places seem to be done by decorators per se although many of the owners are in some kind of creative business. Check out the links I have included to learn more about the talented homeowners. This is the home of Jewelry Designer Solange Azagury-Partridge. This home is full of fabulous color and pattern. It was difficult to pick one image to use. For Ros, this book had to be a blast to write. For Jan Baldwin, what a fantastic job on the photography. This is the home of Peter Hinwood who was an actor in The Rocky Horror Picture Show and is now an antique dealer. His home is also featured on the cover. I just love those turquoise walls and all the Islamic tiles. And that crazy striped chair and the cat pillow. More gorgeous color from Peter Hinwood's home. That green wall. Fabulous! This is Annabel Lewis's home. She owns the ribbon shop V. V. Rouleaux. Fabulous store - fabulous home. This is the home of Liddie Holt Harrison. Liddie is a model - you may recognize her if you are an longtime knitter - she was on the cover of Rowan Magazine #04. Liddie's home is quite eccentric - full of all kinds of taxidermy and antiquities. She is a shop owner and antique dealer now. I've got great news for all of you. 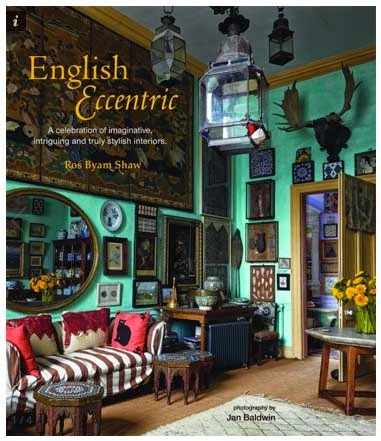 One of my lucky readers will win their very own copy of English Eccentric supplied by publisher Ryland Peters and Small. Here's how you enter. Answer the following question in the comments section. Deadline is Monday October 13th at 11:59 p.m.
What is your favorite space in your home and why? OR What would you like to change about your living space? OR any other random thought about home and color! I would change the clutter that goes with everyone being a collector in our family of four! We have stuff everywhere . . . I love my little apartment but would love to colorful walls. Some really cool interiors. I hate looking in the reality section of the paper and seeing beige and or yellow walls, blah. My favorite room of our house is the 'den'. It has a wonderful wall of windows along the north side of the room. Wood paneling with brick fireplace on on the east. Wood bookcases and closet on the south and 1/2 paneled wood(wainscoting) with yellow (yeah, I know I said something about yellow, but this is a deep yellow) walls on the west. Any one that has visited our house finds themselves drawn to this room. The windows look out over our backyard (with feeders, birds, squirrels and giant oak tree). When my parents visited the first time, my husband found the three of us lined up looking out the windows. My brother calls it "The Observation Deck". The whole room is cosy and wraps you in its embrace even if you aren't looking out the windows. I would change my living space to have more colour and expression of who I am and not confine my space to the norm or the expected. Love your ideas and the colour! I love my third floor studio! Cozy, quiet, and full of all my favorite books, fabrics, yarns, and threads. I pulled up the carpet a few years ago, and the ratty hard wood floor could use a couple coats of bright, fun paint! I think my email shows for you, but also, I'm seedesigns on rav. My favorite place is my couch, where I stitch, read, draw, read blogs, write, and listen to audiobooks. I am surrounded by all the things I like, though I want to get rid of some of the clutter. I love your designs and your intro video on Creative Bug is great. I would find a way to store all our collections so they were easy to access, but dust free. A family of four collectors means we have piles of books, craft stash, LEGO, etc all over the house. One of my favorite rooms is a brick-walled, window lined room in the back. Presently cluttered but not for long! It is my fall goal to make it a learning and crafting place! Thank you for the chance to win. My favorite room in my home is the kitchen. The table is too cluttered and I'm not sure it's the right table for the kitchen. The slate counter top has seen better days. Parts of the chair in the corner have been shredded by the cats. It's the room where we spend the most time. We both enjoy cooking, not fancy stuff, but just good home cooking. The kitchen has a big farmhouse style sink, a beautiful stove top and double ovens. There are two big windows that look out on our backyard. The cabinets are custom made with curly sycamore. The space between the counters and cupboards has square tiles in different shades of green. We did none of this. Our home was owed by two architects and they did nice work. If you really like to cook, I don't recommend slate counters. It's impossible to keep them looking nice if you cook a lot, so we gave up. I'd rather cook than have nice looking counters. The upper kitchen cupboards have some sort of art glass, so you can sort of see into them. The former owners, the architects, painted the shelves and interior of these cupboards a beautiful orange-red color. However, they painted the walls a very, very, very pale green. It was so pale, it was almost off-white. My contribution to the kitchen was color. I repainted the walls the same orange-red color as the inside of the cabinets and it made the kitchen come ALIVE!! Thanks for this excuse to write about my home. It feels so incomplete, clutter, messy and frustrating at times. As I was writing this, I spent time thinking about what I love about my home rather than the rest of it. Now I'm off to brew a pot of tea and sit in the kitchen. Hi Kristin! I really like my living room/dining room especially during the cool and cold months. We have a variety of patterned rugs which look crazy but feel cosy! What I would kill for in this house is more storage space...we have only two useable closets! We are in the process of working on our third older home. I have been trying to push myself out of my color bubble and I think it is working and i Love how things are coming together. This book would help me on this journey. Thank you pegmac on ravelry. My favorite spot in my super tiny house is my desk nook. I have made a collage of photos, keepsakes, my son's art work as a little guy and small toys. I have arranged the items in six painted wine crates that sit on a ledge over my desk. My desk is next to a large window overlooking my garden. I have the furniture and room painted in shades of turquoise and purple. I use the space on the weekends to dream, email friends, watch movies, read favorite blogs, and yes, to do work and pay bills. But it is primarily my go to space to recharge. I love my little Mexican bathroom. It was kind of a dank room when we bought the house..but eventually we fixed it up! Periwinkle paint on the walls...a beautiful painted mexican sink. A carved wooden mirror frame and some brightly framed embroidery on the walls! It's delightful! We have a 30x15 screened in porch that looks out into a tree filled space. I have hummingbird feeders and moon flowers to gaze at now but that will change to goldfinches and pine needles soon. (we live on the gulf coast where its still in the 80'sF) There are ceiling fans but mostly nature colors of shades of brown. It is a peaceful place. I hope to be bold enough one day to have more colors out there. I tried for sunflowers but the squirrels ate them too soon. Such inspiration. Thank you Kristin. My favorite spot is our cozy screened in porch where we have a candlelight dinner almost every night that it is warm enough. My favorite space depends on the season, in late spring, summer and early fall, my porch with all the eclectic things I have created or gathered from tag sales, plus it abutts my small garden . When the temperature drops my favorite place is my feather chaise- picked up at a tag sale- the story includes coming from the mid west and, when I found her, Orleans, MA. I spend much time in my chair relaxing- knitting, sewing, asst needlework, reading and dreaming (sleeping!). love english homes! 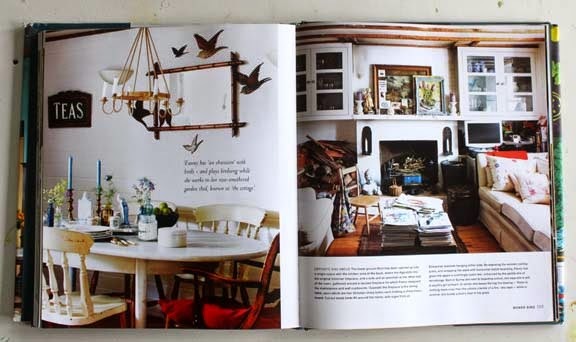 Country Living UK my favorite mag would like to get world of interiors but as they are so pricey stick with CL UK. when i moved into my flat - its a railroad layout - i had all the rooms painted . rose pink bathroom, sunny yellow kitchen, dark blue den, pale green hallway and bedroom and study and deeeeep red for the music room. have never tired of these rooms in the amost 10 years here. as i am of the 'more is too little of the same' plan of decor all rooms have lots of color. however as the flat is tiny - 12 wide and each room is about 12 long except the combo kitchen/bathroom is slightly larger... anyway, not that much to change except moving some things and decluttering. it is cozy in the winter months with the wool curtains on all the doorways (its sadly not insulated so rather chilly in the winter). and lots of wool blankets and wool sweaters to cuddle up in so as not to turn on the heat (which is akin to heating the outdoors - see no insulation above). however sit on my outdoor patio for as long as i can until its too cold - as its really the outdoor dining room. I love my living room---pale apple green walls, lots of light, and my harp! It's lovely in any (and every!) season. I am pattyr on Ravelry. I love my half bath the best! It just has the most country primitive style that I love!!! My yellow living room is a close second. I love having lots of bathrooms in my house. It's more work to keep lots of bathrooms clean, but the privacy is nice! I would like to have a lot less stuff and work on getting rid of 'stuff' a bit at a time. I like clean, uncluttered spaces, yet our bedroom is the most cluttered space in the house. It's where I shove everything I want out of sight. While I'm fairly bold with color I'm not so bold at mixing patterns and color. I would be more adventurous in this area and give my home that individual style. Thanks for the giveaway, the book looks wonderful. My favorite room in my house is my yellow kitchen. People say, "eeuuww a yellow kitchen!" I used to be ashamed of my yellow kitchen. It is small, outdated, and shabby. But it is MY yellow kitchen. It represents all that is imperfect in this world. I say hello to my yellow kitchen every day when I come home from work. It waits for me and gives me comfort. I love my living room. I have a recliner in my knitting corner that faces the 12 ft picture window. This looks out over our front yard and across the street into the front and back yards on the next block. It the winter it is sunny in the mornings. Now, the colors outside are just fabulous with a lovely sugar maple, pampas grass and burning bushes. Happy Thanksgiving from a Canadian fan! My favourite room is my studio which has yarn-covered walls, a giant antique desk, two beat up old rusty coloured love seats, a sweet antique chair with a hand appliqued seat, and all my knitting, crocheting, spinning and stitching paraphernalia. It is truly my "happy place". My favorite space is our front sun porch. We replaced the windows and put in a lovely wooden/glass door (against the advice of everyone but I love it). There is a window into the next room and I hung curtains on the porch side - the only window of 7 on the porch with curtains! Floor to ceiling bookshelves on the one solid wall, two slipcovered chairs, a fabric-covered footstool from our neighbor's house when they moved away, and my grandparents' table. Oh, and a floor lamp from my grandparents' home too. Plus, cat beds on the chairs, table, and footstool. The "girls" love to spend the day out here in the sun that comes through the apple and cherry trees that provide privacy and keep it from getting too hot in the summer. The walls are, I admit, a boring cream color, but the books, curtains, slipcovers, and throw pillows bring in lots of color. I'd love to paint my kitchen chairs different colors! I'm not thinking too much about inside my home- I want to be outside enjoying the wonderful warm fall weather. This past weekend my daughters and I attended the Trailing of the Sheep. We had a great time. Your sheep moving in the country setting is far nicer than the sheep going down Main Street in Ketchum, Idaho - Followed by the street cleaning machines! My favorite space in our home is our screened porch. It's such a peaceful spot, but it does need some new, more comfy porch furniture and some splashes of color - pillows on the porch swing, perhaps.